Just a quick post to offer up a cute gift idea. All of which can be found at your local TJ Max or Target. 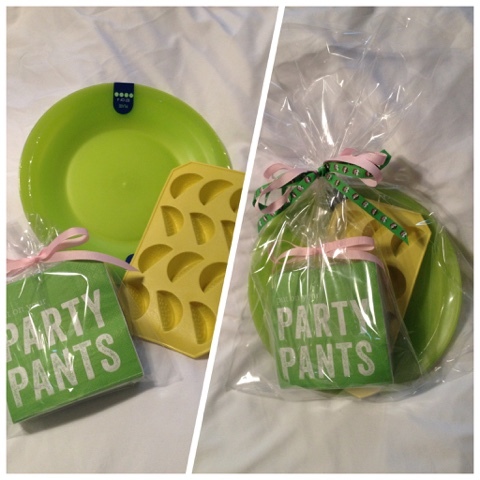 I just took a cute little lemon shaped ice cube tray, a pack of cute cocktail napkins, and a set of coordinating plates (paper or plastic both work), all in coordinating colors or theme. Slip them in a clear cellophane bag and tie with a colorful grosgrain ribbon. Done. I swear I could put rocks in a clear cellophane bag and make it look cute. How did I ever wrap gifts without them?! What a great idea ... where do you buy cellophane bags? Great idea....I never thought of cellophane to wrap gifts. And yes....where do you find them?